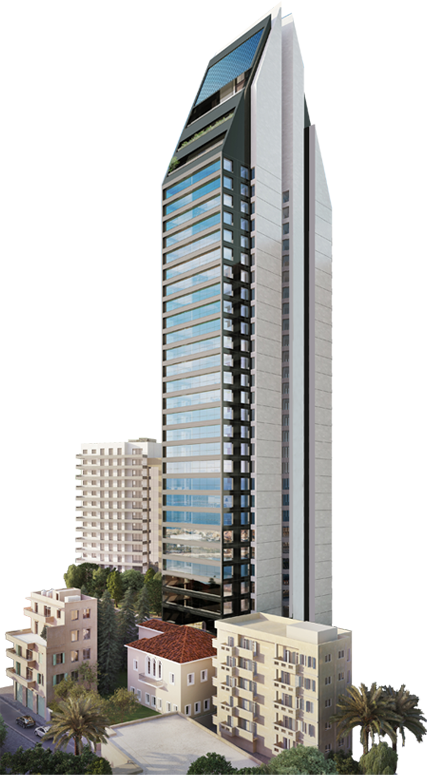 The Tower consists of 28 floors divided in 2 blocks (A & B), with a separate main entrance lobby for each block. 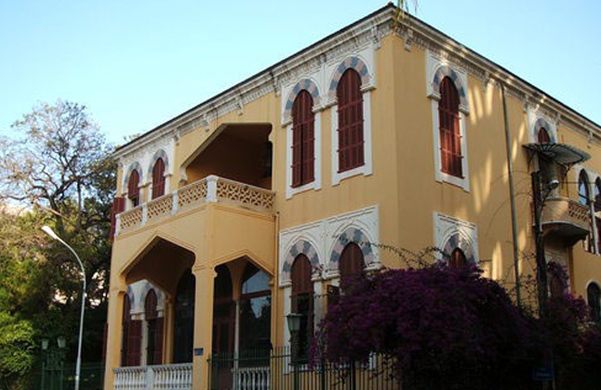 There are two medium size apartments of 325m2 per floor, and each has its own private entrance. 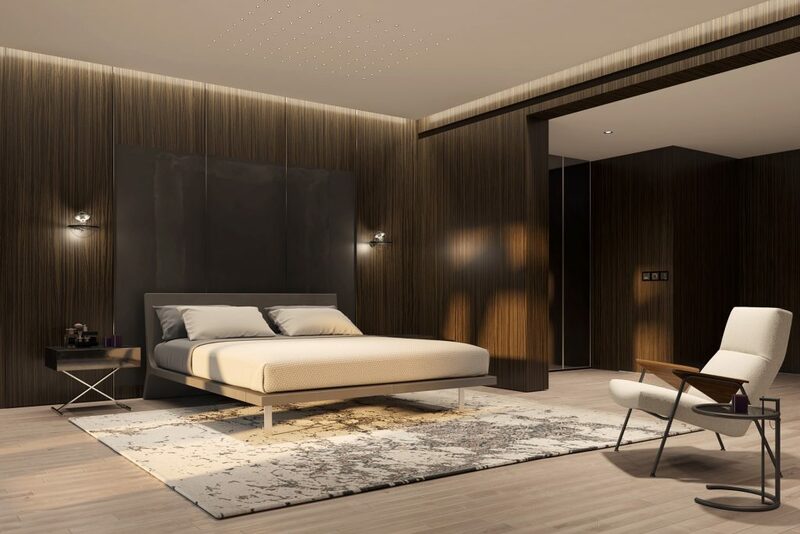 The apartments can either have 3 or 4 on-suite bedrooms, depending on the customer’s preference, in addition to a spacious living room. A service elevator serves the 2 apartments and leads directly into the apartment’s kitchen area through a service door. 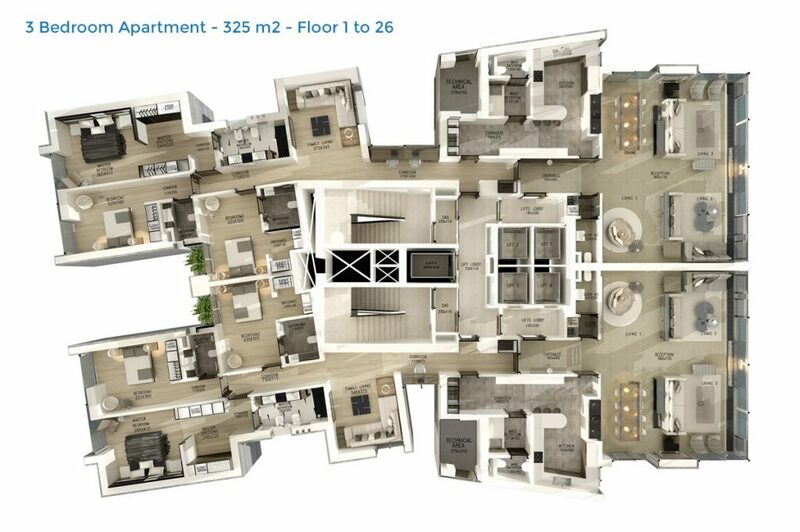 Spaces have been efficiently designed to offer ultimate comfort and convenience with maximum luminosity. 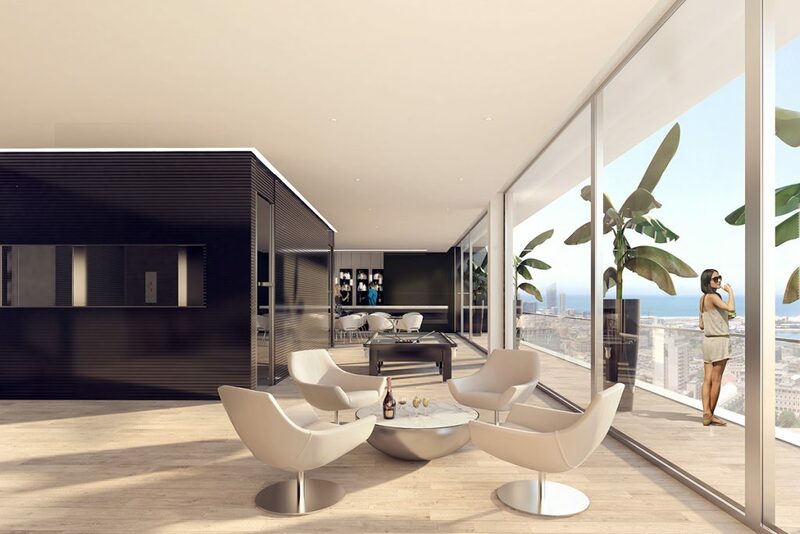 Air and light have also been designed to flow freely throughout the interiors to maximize residents’ well-being. 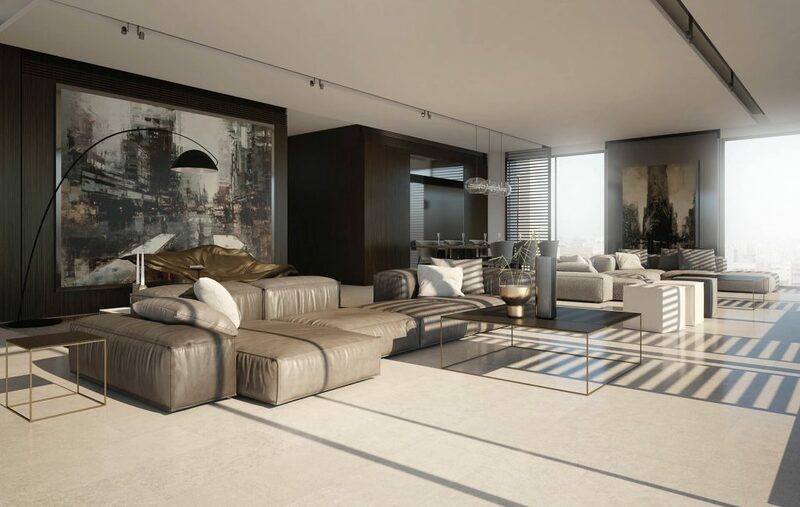 All apartments and common areas are fitted with the best fixtures and finishing materials that have been carefully selected by a distinguished interior design company to reflect the Tower’s splendor. Sturdy seismic design (acceleration 2.5m/s-2). 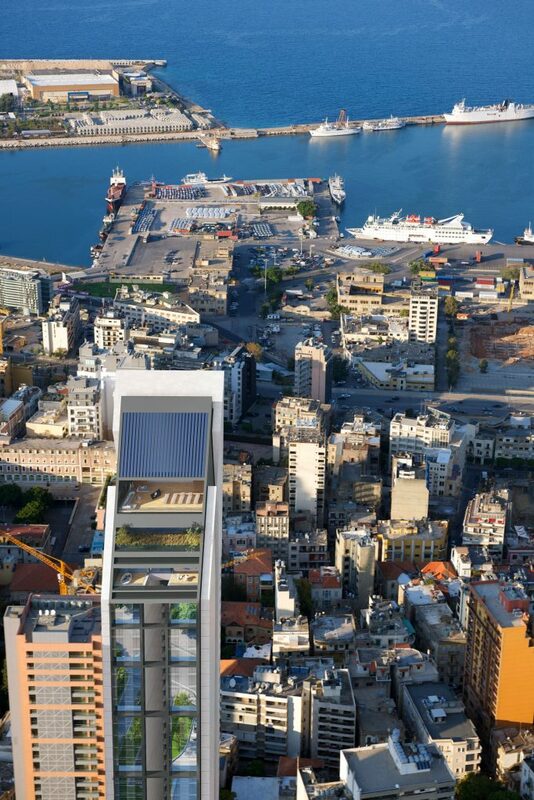 Eco-friendly with many Green features including gas and solar panels for sustainable hot water and heating generation – solar panels would satisfy around 70% on average of the annual hot water and heating requirements of the Tower. 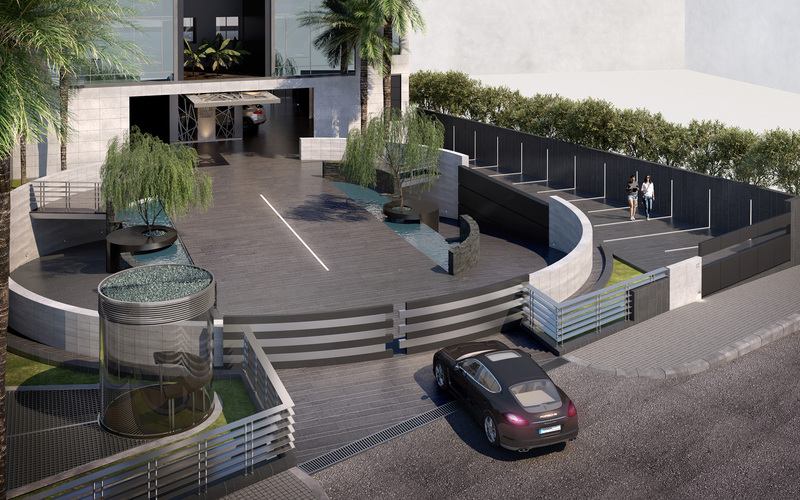 Beautifully landscaped drop-off court in front of the Tower with independent entry and exit ramps to the garage (automatic irrigation system to all common areas and planters). 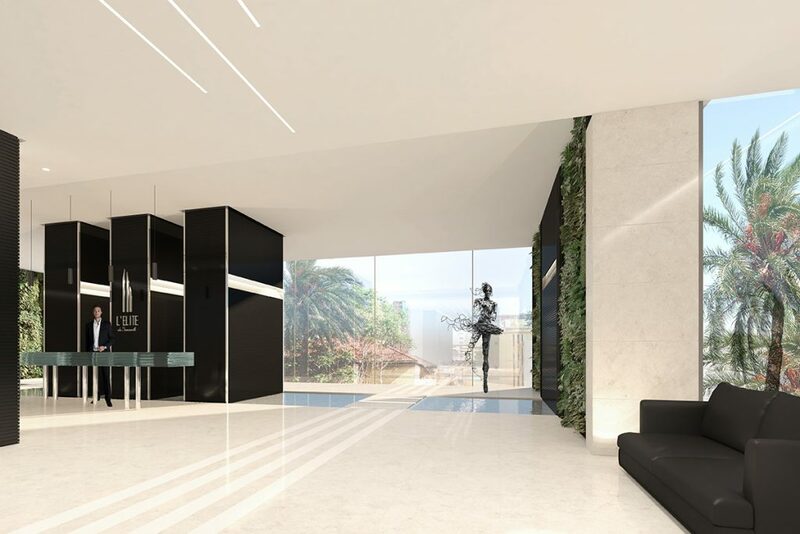 Spacious and high-ceiling lobby (4.5m) finished in rich marble, glass, wood and stainless steel. Double walls for all external masonry (minimum 3 cm airspace). Double-glazed aluminum panels with Slide system for main façade doors and windows SCHUCO, GUTMANN. Roller shades (TechnoShade) motorized by SOMFY, DOMECO, GUTHMANN. 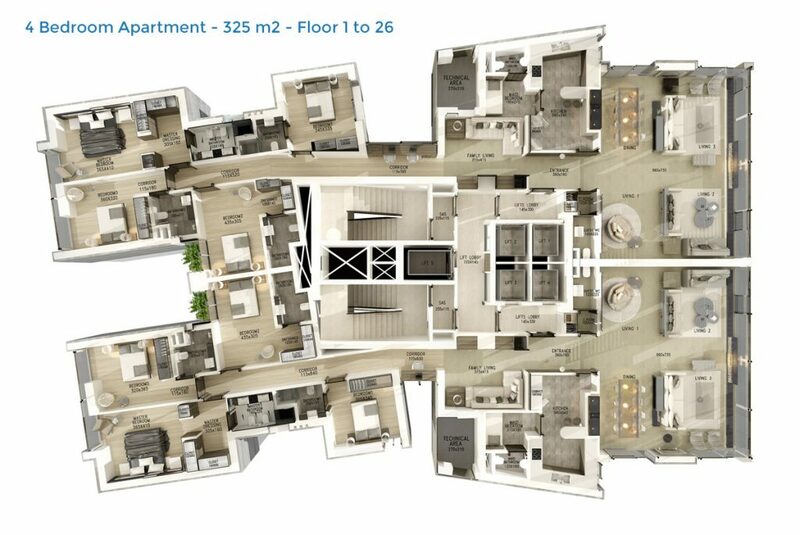 High ceiling of 3.2 meters (net) for all apartments. 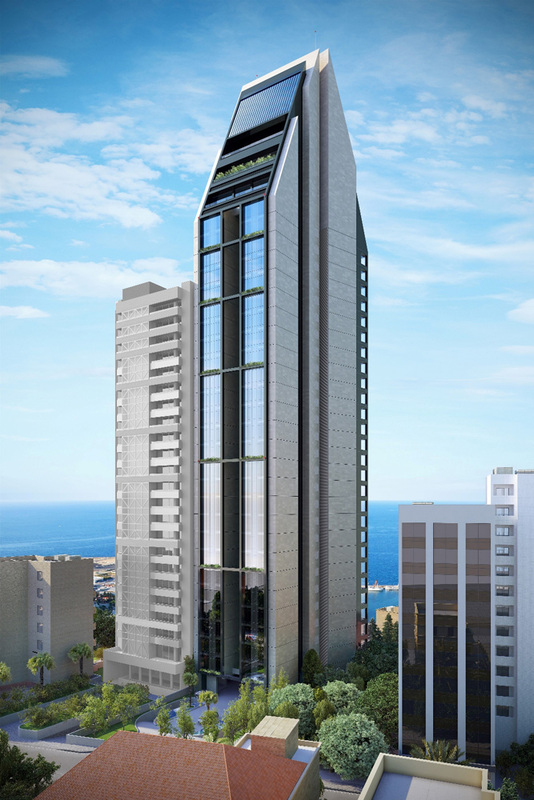 Service elevator with a dedicated service entrance opening directly into the kitchen area in all apartments. Drivers’ waiting room and facilities. First basement level dedicated to visitors’ parking. 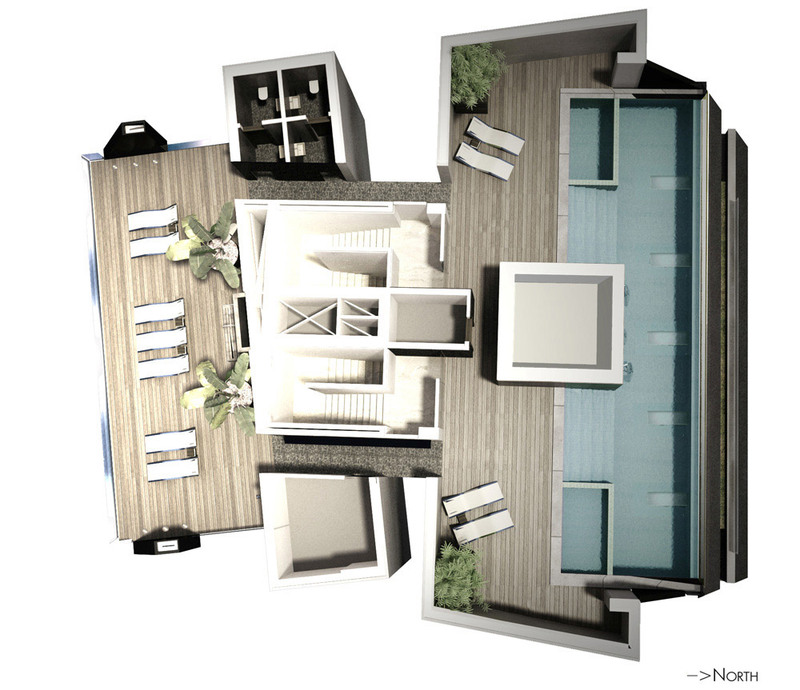 Fully furnished club house at the roof of the Tower with modern gym facilities, topped by an infinity pool and a sun deck for residents and their guests. 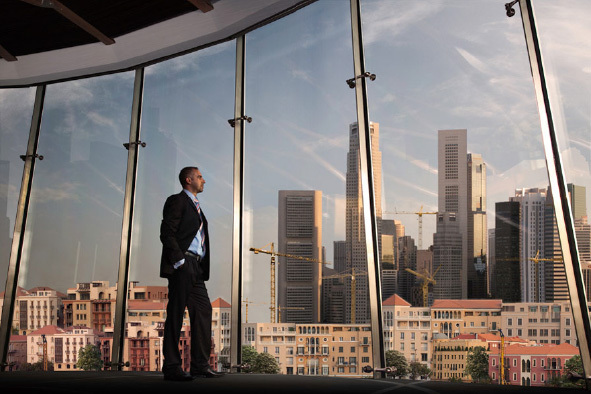 Modern “Building Management System” to manage all common areas and facilities. 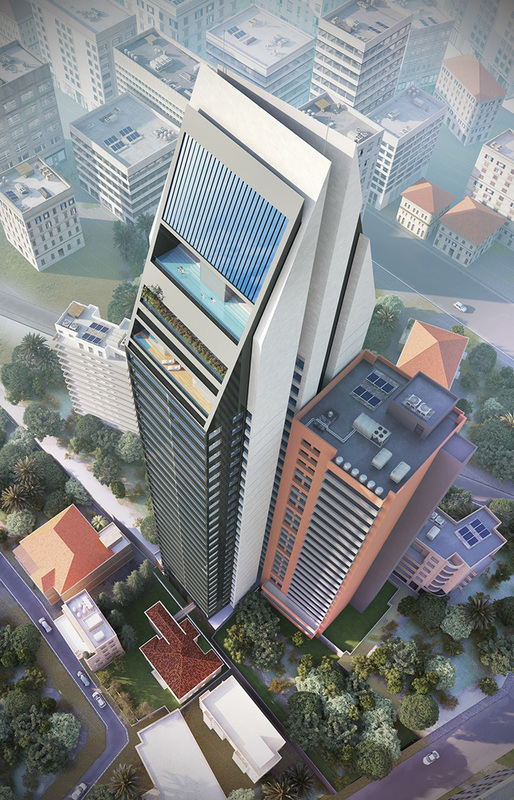 Four VVVF high-speed (3.0 m/s) passenger elevators (2 dedicated for each Block) and one VVVF High-speed (2.5 m/s) service elevator for both apartment, MITSUBISHI. Variable Refrigerant Volume (VRV) air-conditioning HITACHI, TOSHIBA, DAIKIN. Independent gas boilers located in the shaft of each apartment on the same floor (UNICAL, FERROLI) with individual counters for the consumption of gas. Floor heating in the reception area and aluminum heating radiators and towel dryers in the bedrooms and service area, ACOVA, ROCCA, FERROLI, ZENDER. Artesian well and water treatment plant. Polypropylene pipes inside the apartments, European galvanized steel pipes for cold water in common areas and UPVC pipes (European standards) for sewage and drainage. Wet riser in case of fire, with automatic sprinkles in parking area and hose reel on each floor. Fire escapes shall be pressurized. Design of cooling, heating, ventilation and load calculation shall be as per ASHRAE international standards and applicable local public safety laws. Videophone entry control system, FERMAX. Full load back up power generators with automatic transfer switch, PERKINS, CAT. Fire alarm system in common areas, EDWARDS. 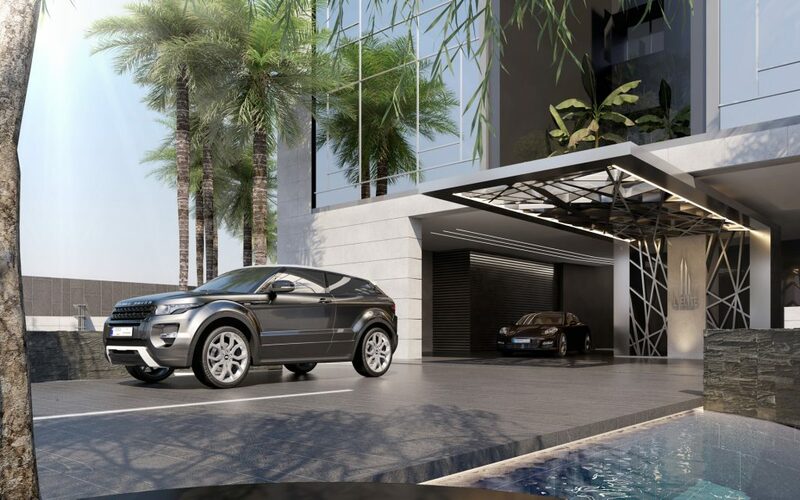 An impressive drop-off zone welcomes residents and their guests into the Tower, with a circular driveway, magnificent landscaping and splendid water fountains that set the tone for luxury and high-end living. 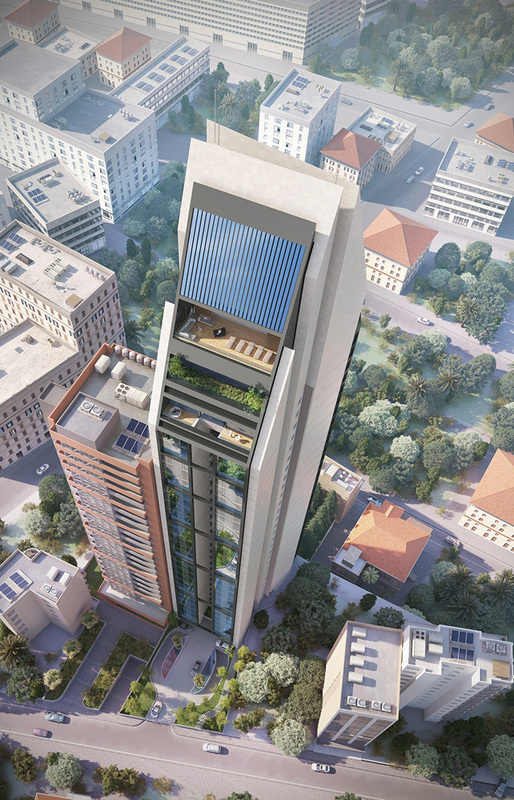 For those privileged to live at L’Elite de Sursock, they will enjoy a sumptuous and dazzling lobby finished in rich marble and wood, with large floor-to-ceiling windows overlooking the surrounding beautiful gardens. 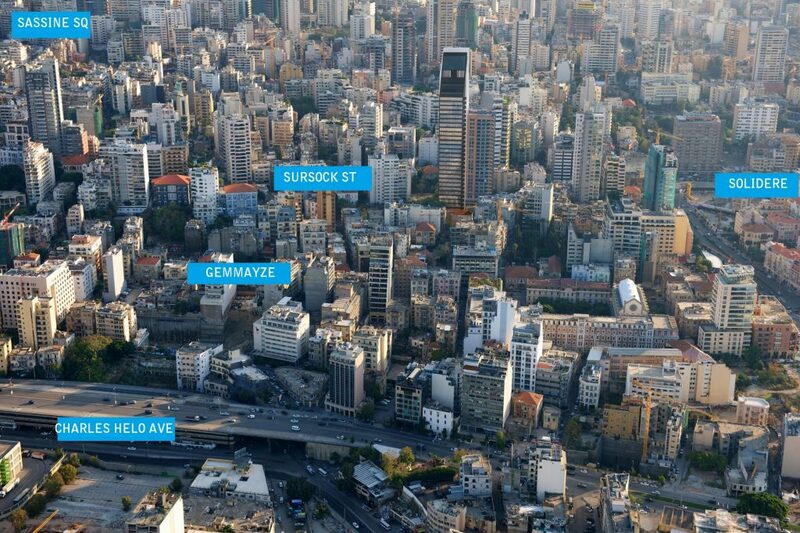 Discover one of Beirut’s most impressive rooftop pools. Towering at 150 meters above sea level and sweeping across 20 meters, the stunning outdoor Infinity Pool offers the best city-skyline views along with an eagle-eye view of the Mediterranean and the surrounding mountains. Whether you want to lounge about, socialize or play, unwind in the remarkable Infinity Pool that offers it all. 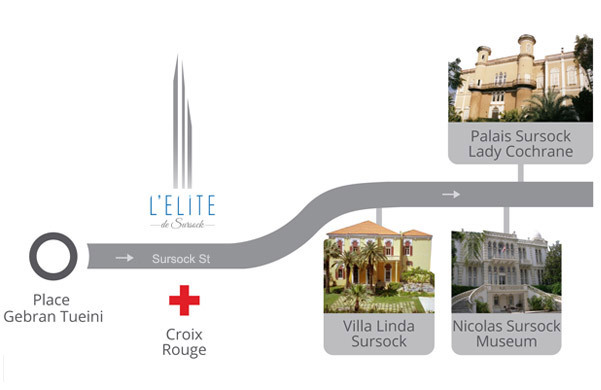 Escape to the 29th floor of L’Elite de Sursock where you will find the Clubhouse tucked away beneath the rooftop pool. 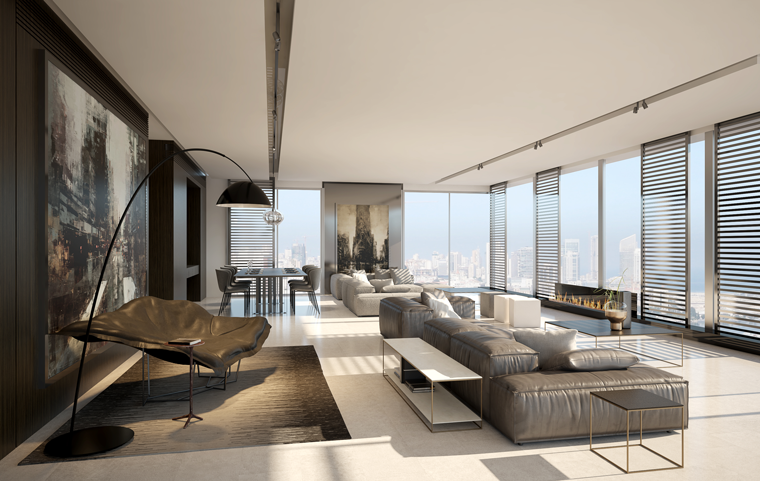 The spacious interior offers 500m2 to cater to your needs with the bonus of spectacular views. 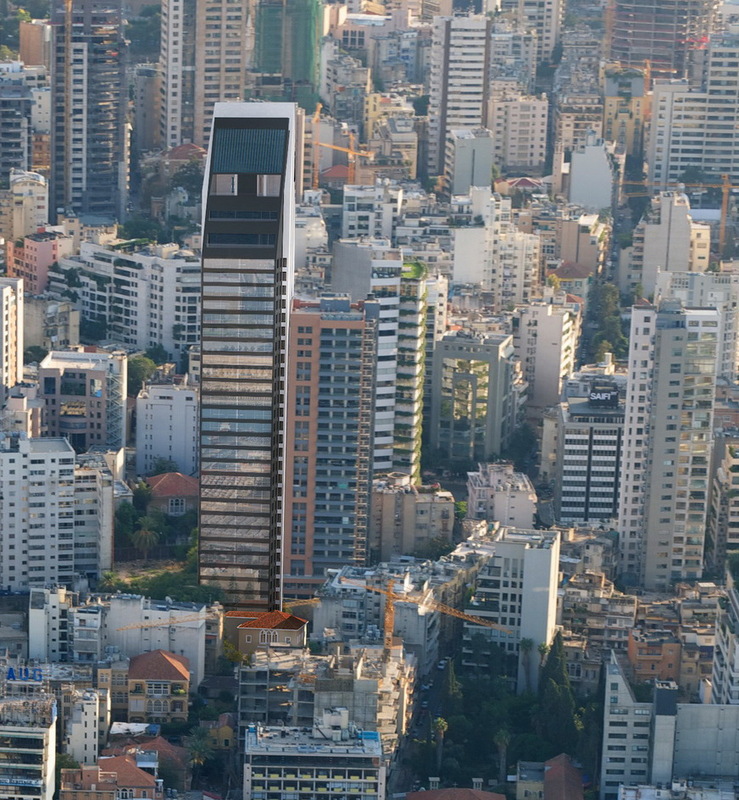 Work up a sweat in the fully equipped gym overlooking the Ashrafieh skyline, relax in the lounge or simply gaze at the breathtaking views of the city and the sea. With locker room facilities and a private massage room, this clubhouse will certainly exceed your expectations. Looking to throw a party? 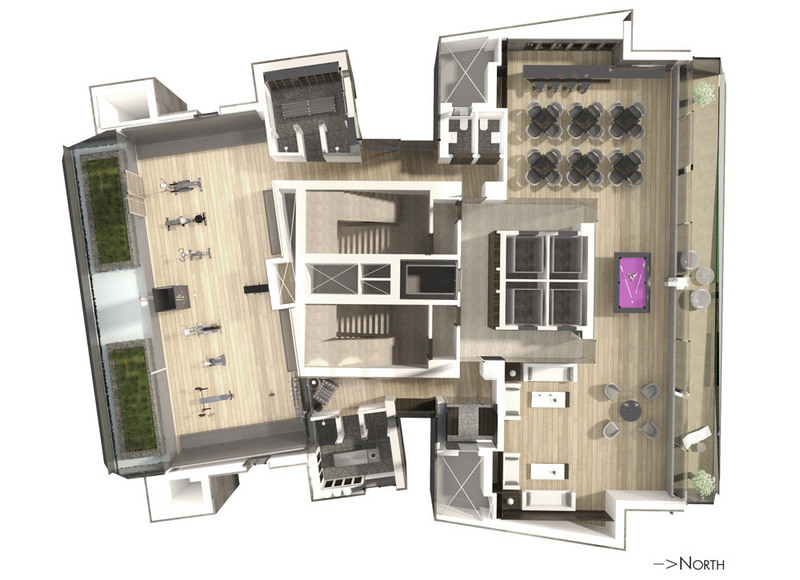 The space can be reserved by residents for private functions and events, also offering its own kitchenette and bar. Independent gas boilers located in the shaft of each apartment on the same floor (CHAPPEE, IDEAL STANDARD, DEDIETRICH) with individual counters for the consumption of gas. Home automation system, CONTROL 4. Switches, sockets and outlets LEGRAND, with earth. Switchboards and circuit breaker SCHNIDER. Reception, Dining and Guest Areas: High-quality marble (at least 80 cm x 80 cm) CREMA MARFIL, BOTTICINO. Bedrooms: Engineered wood parquet flooring. Kitchen and Service Area: First choice imported ceramic tiles. Bathrooms: Guest high-quality marble. 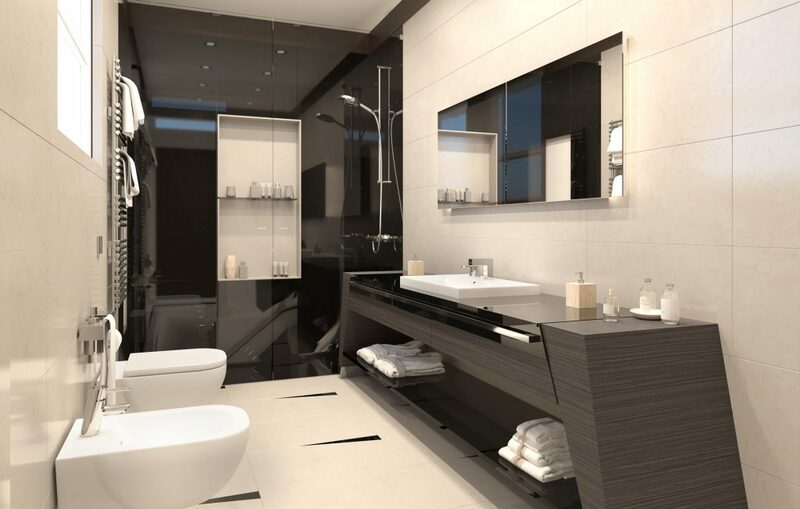 Master, Children and other bathrooms first choice imported ceramic tiles. Main Entrance Door: French Oak or Walnut solid wood. Doors in the reception and bedroom areas: French Oak or Walnut veneered leaf. Doors to stairs, fire escapes, and emergency exits: 2 hours fire resistant. Closets and wardrobes: Handless doors in French Oak or Walnut veneered leaf with same color melamine interiors. Walls: Quality imported paint material (3 coats of putty & 3 coats of paint) alkyd painting finish, acrylic. Ceilings and false ceilings: Vinyl emulsion paint finish. Water resistant gypsum board on steel structure, KNAUF. Wall hung toilet, bidet and wash basin, VILLEROY & BOCH. High-quality imported kitchens with granite for worktop with full backsplash BULTHAUP. For pricing information, please contact Capstone Investment Group SAL. For availabilities, please click here. 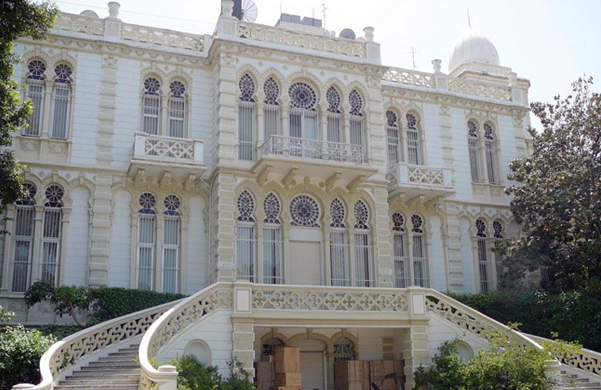 L’Elite de Sursock is situated on Sursock Street at the heart of the “Golden Triangle” in Achrafieh, in an unrivalled location where prestige combines with luxury and convenience to offer the ultimate address… The project is easy accessible and nestles on top of a hill overlooking the Mediterranean Sea, the city and the surrounding mountains in an oasis of greenery and calm, in the midst of the bustling city and at the doorsteps of the best galleries, shops, restaurants, cafes, malls and hotels the country has to offer. 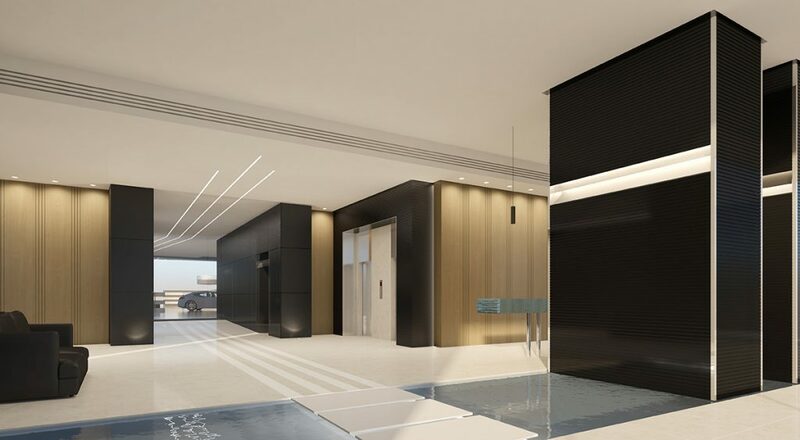 Capstone Investment Group SAL (Capstone) is a full-fledged real estate developer dedicated to developing upscale residential, commercial, retail, hospitality and mixed-use properties for today’s sophisticated buyer. 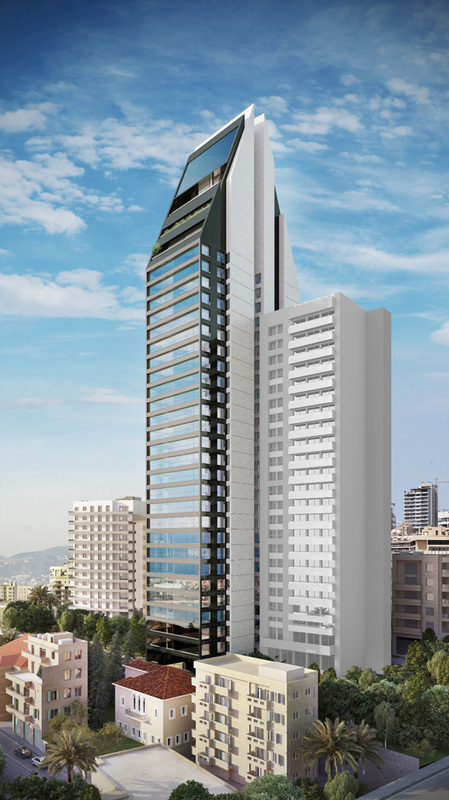 Capstone’s Development Management Services steer a project from its initial stages to final delivery, from project organization and design to final handover to end users, with the help of a highly-motivated and dedicated team of real estate sales & marketing executives. 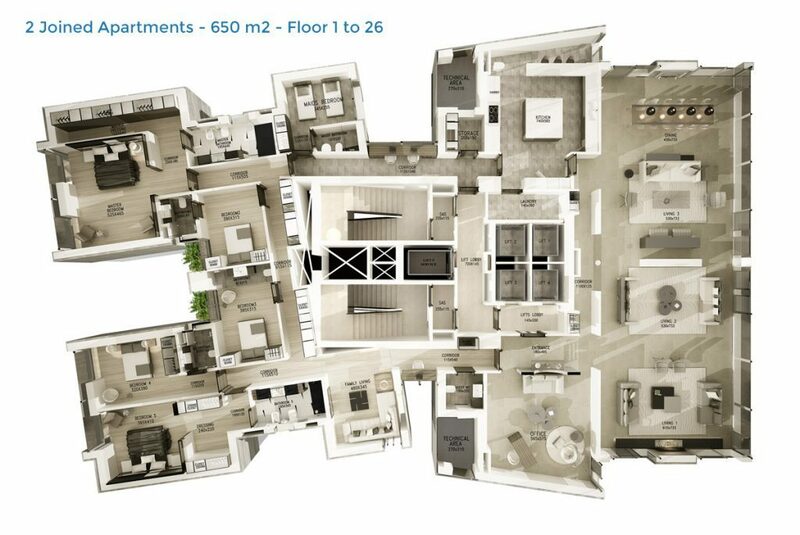 Our development strategy aims to offer products that are unique and different than our competition, primarily on the basis of location, stylish design, efficient floor plans, quality construction, first-class amenities and ongoing maintenance after delivery. 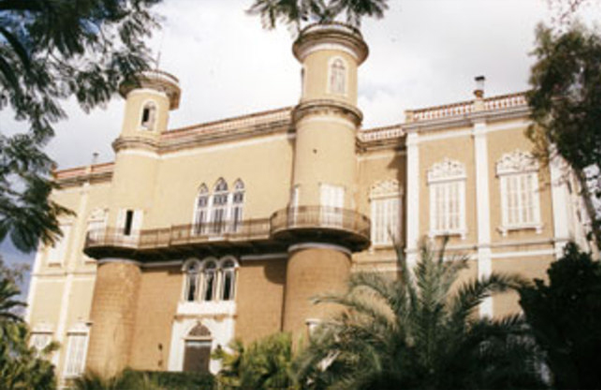 We strive to plan very carefully and give attention to detail to create settings that make living most enjoyable. 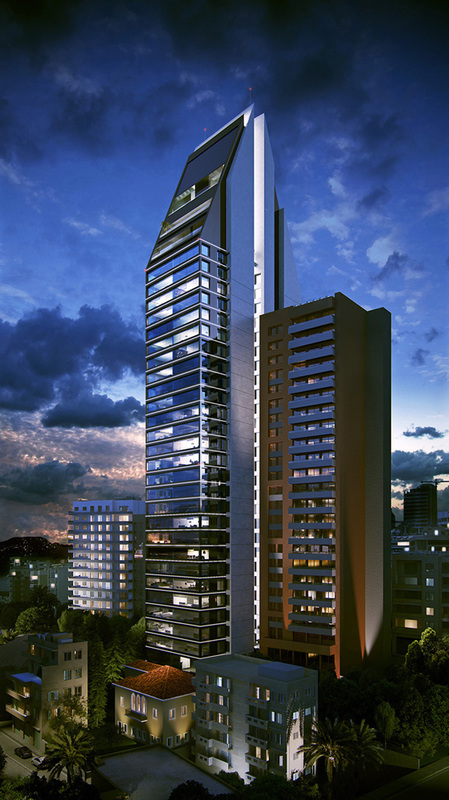 We collaborate with renowned architects and design professionals to create innovative projects. 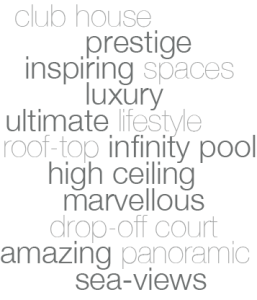 With our hands-on approach and dedication to excellence, we are committed to raising the standard of living in our properties.